Restaurant Mason must be doing something right: on the top end of Hunter Street on a quiet Tuesday night, it’s pumping. 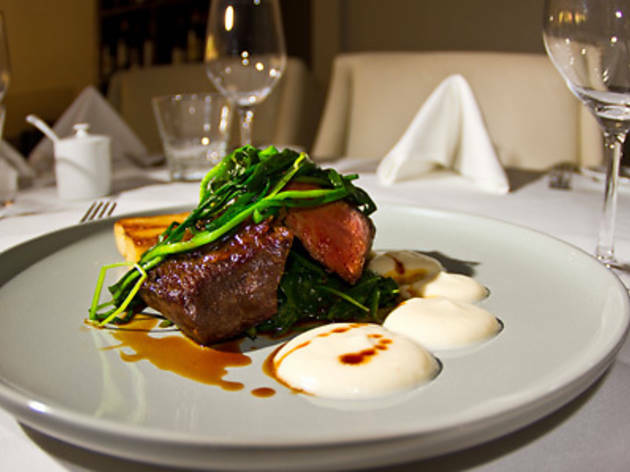 This upmarket bistro, opened in late 2011 by Ami Thornton and husband Chris (ex the Ledbury in London), pulls in the local smart set with Chris’s Mod-Oz stylings and service that is attentive and wise to provenance. Entrées show plenty of creativity. A hen’s egg in a deep-fried potato shell comes swimming in smooth yellow polenta like a golf ball in custard, and bursts open to give good yolk. Together with a clutch of autumn mushrooms, it’s a savoury, breakfasty surprise. Three nicely seared scallops, each partnered with a house-made gnocco, waltz around a plate, spurred on by a spike of heat from Moroccan spice ras el hanout. So far, so good. We’re not sold on the fish of the day – sweet barramundi flesh fights against a sweet jus – although the accompanying veges (caramelised leek, parsnips, artichoke) are deliciously golden. 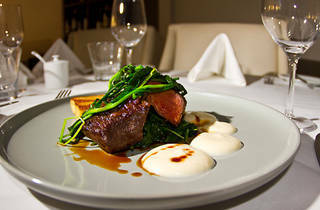 A safer option has slices of dissolve-in-the-mouth waygu rump brushed with miso and aligned with potato cream, spinach and a cheeky puck of deep-fried marrow that’s rich and satisfying. A topping of mini potato crisps and shallots adds crunch. An assiette of chocolate, uniting sweet ganache, dark mousse, white-chocolate cream, a brandy-snap style biscuit and strawberries, is more of a motley crew than a united front, but the carrot cake is an out-and-out winner. A narrow, four-storey rectangle like a modernist office block is topped with an almost indecently young little Dutch carrot and served with chai tea ice cream and a livid swoosh of carrot puree. Earthy, sweet flavours are all in harmony. The room’s décor may be textbook minimal – white tablecloths, banquettes and wooden chairs – but the atmosphere is anything but hushed. Groups of four or more are crammed in and many of the tables seem to know each other. Novocastrians have clearly found a reason to get together and celebrate in what the Thorntons are offering.